If you’re needing to look up a specific transaction or a customer to view their details you can do this from within the transactions area in ThriveCart. This area holds all the information about the payments your customers have made and your customers themselves. We can access the transactions area in your ThriveCart account by visiting the transactions menu item from your dashboard. We’ll then be shown an overview of your transactions with various options. We’ve got a whole section on managing your customers if you’re looking for more specific tasks. The transactions area though will let you search your customers by their name, email address, or order ID (found on the receipt). 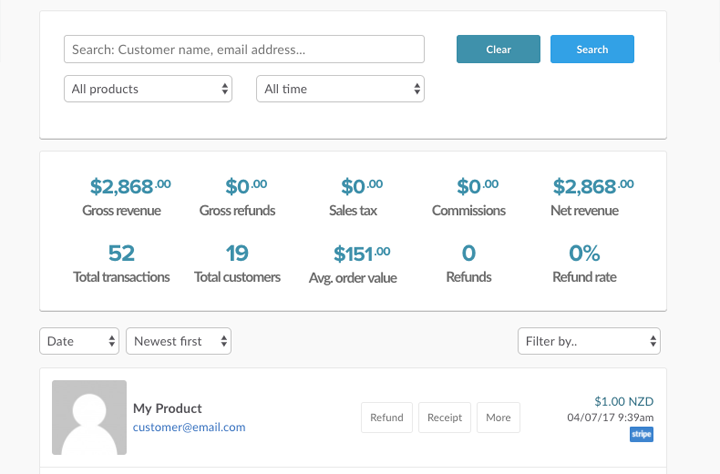 You can filter results specific to certain products in your account and time frames. The financial information that’s displayed will update automatically based on your search and filtering options. The transaction details will give the customer name (if taken at checkout), the product they’ve purchased, their email address and Gravatar Icon (if connected to their email). You will also have the options such as refunding the payment, managing subscriptions, viewing their receipt or clicking ‘more’ to go through to the customer’s profile. You’ll also be shown the net revenue from this transaction, the time of the transaction local to you (if you hover over the time you will see the system time of the transaction), and the payment processor used. At the very bottom of the page, you’ll also be able to download a CSV of your transaction results.